A former Governor of Taraba State, who had his eyes on the Senate, sat teary-eyed, startled and devastated, as he looked on helplessly in the courtroom. Justice Adebukola Banjoko of the Federal Capital Territory, FCT High Court, Gudu, had just drawn the curtain on his 11-year-old trial, and it was the last thing he had expected, seven months to his 63rd birthday. He swaggered into the courtroom that Wednesday morning, May 30 at about 9am in the company of his wellwishers, with an air of confidence around him that the day will end with him smiling home a free man. But no! After a proceeding that lasted about six hours, with the judge reading a 288-page judgement that lasted about five hours, Nyame had become a convict, destined to spend the next 14 years in Kuje Prison. stationeries in count one for the sum of N250 million”, after dismissing the arguments of his counsel, Olalekan Ojo, who contended that Nyame was “neither a Public Servant nor a Public Officer, but a Political Office Holder” and so could not be charged with criminal breach of public trust, misappropriation of public funds, or receiving gratification. 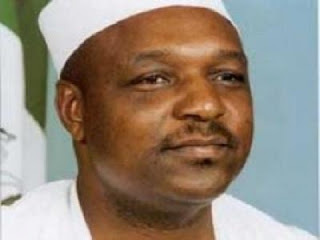 The EFCC had alleged in count one that between January and February 2005, Nyame being governor, was “entrusted with the sum of N250 million meant for the purchase of stationeries by the Taraba State government”, but diverted same to his use, thus committing an offence punishable under Section 315 of the Penal Code Act Cap 532 Laws of Federation of Nigeria 1990. It was the first count out of 41, levelled against him in a charge filed and dated July 13, 2007 – barely two months after Nyame finished his second term as governor. Specifically, the EFCC accused Nyame of criminal breach of trust in counts one, two, six, 10, 12, 14, 16, 18, 20, 22, 24, 26, 27, 28, 29, 30, 31, 32, 33, 34, 35, 36, 37, 38, 39, 40 and 41. In addition to complicity in diverting N250 million purportedly allocated for purchase of stationeries, he was accused of diverting for personal gains, N180 million out of the N250 million; criminal breach of trust with respect to taking possession of N165 million on February 14, 2005, N27 million on April 11, 2005, N42 million on April 11, 2007, N15 million on January 18, 2007, N25 million on January 30, 2007, N20 million on February 19, 2007, N2 million on March 7, 2007, N10 million on March 24, 2007, N20 million on March 30, 2007, N9.4 million on December 15, 2006, N25 million on January 8, 2007, N20 million on May 7, 2007, N25 million on November 12, 2006, N10 million on October 31, 2006, N5 million on March 16, 2006, N5 million on March 13, 2006, N25 million on May 4, 2007, N5 million on June 16, 2006, N5 million on October 10, 2006, N25 million on June 26, 2006, N30 million on August 8, 2006, N3 million on August 24, 2006, N10 million on May 6, 2006; and N32.3 million meant to make preparations for then president, Olusegun Obasanjo’s visit to Taraba on April 11, 2005. Nyame was also accused of “criminal misappropriation of public funds” in counts three, seven, nine, 11, 13, 15, 17, 19, 21, 23 and 25 – N24.3 million (purportedly released for purchase of grains for the state) on July 8, 2005; N27 million on April 11, 2007, N32.3 million on April 11, 2005; N42 million on April 11, 2007; N15 million on January 18, 2007; N25 million on January 30, 2007; N20 million on February 19, 2007; N2 million on March 7, 2007; and N4 million on March 24, 2007. The EFCC accused him in counts four and five of receiving gratification of N80 million from Suleiman Abubakar of Alusab International (Nig) Limited through Salam Global Ventures (Nig) Limited, as reward for awarding contract to Alusab for execution of a water project at Ibi/Wukari. The offences were committed between January 2005 and May 2007. Call it the serendipity of stumbling across a goldmine and you will not be far from the truth. Nyame was in fact, never in the purview of the EFCC, and no one at any time wrote a petition against him. There was no “witch-hunt”. The Taraba State government had issued a cheque of N135,794,607 in favour of the company, as contract payment for rehabilitation of the Ibi Wukari Water Project. But Suleiman collected the cheque and lodged it in a different account domiciled in Zenith Bank Plc, in Jalingo. Hauwa sought the help of the EFCC to recover the money, accusing Suleiman who took over the company of “squandering” it. burst. During interrogation, Suleiman admitted collecting the cheque, and though argued that he did not squander the money as alleged in the petition, confirmed that it was for the said project, which was ongoing before the death his brother. He revealed that through Abubakar Tutare, then Commissioner of Finance in the state, the company applied for additional works, which was granted by the state government. According to him, the estimation for the additional works was N35 million, but Tutare instructed him to add N100 million to the estimation. Subsequently, a cheque of N135 million was issued to Suleiman, but along with it, was a complimentary card, with an account number written at the back. Tutare instructed him to pay the N100 million into the account. Suleiman had asked Tutare about VAT payment, to which Tutare told him to deduct 10 per cent as tax and to credit the account at the back of the card belonging to Nyame with N80 million, and bring N10 million to him. Suleiman duly paid the cheque into Alusab’s account and acted on the N80 million as instructed, as per the complimentary card. He also gave N10 million to Tutare at his residence through his house aide, Husseini Ali. testimony of Suleiman, but stressed that he acted on the instruction of Nyame, and that the N80 million was paid into the account of Salmon Global Ventures Nigeria Ltd.